The PCs take part in an investigation after an Absalom Station pawnbroker tries to sell the Starfinder Society a lethal biotech augmentation. The search leads into the depths of the station’s Freemarkets and into another investigation initiated by AbadarCorp. With rumors abound of mysterious disappearances near the Freemarkets and that those people using the augmentations are suffering from a mysterious illness, it falls to the PCs to piece together what’s going on. Where is this never-before-seen biotech coming from, and what happens when the augmented dead don’t stay dead? 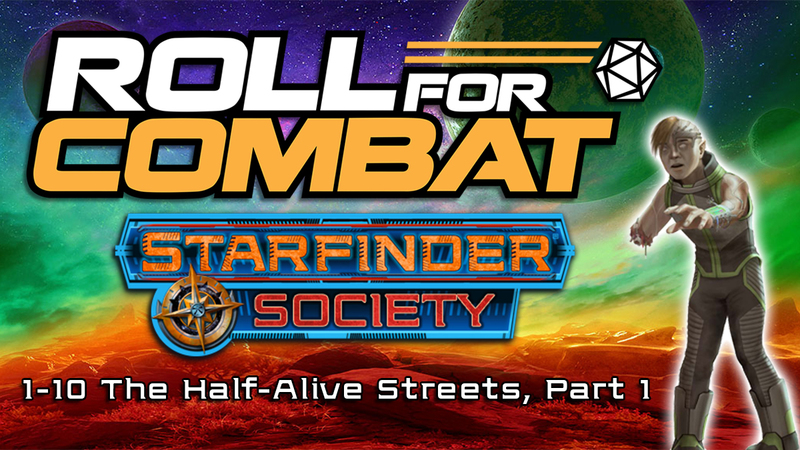 The Roll For Combat Starfinder Society concludes their playthrough of Starfinder Society Roleplaying Guild Scenario #1-10: The Half-Alive Streets. In the final episode, our heroes attempt to negotiate with the manufacturers of the defective biotech augmentations, but it sounds like they won’t go down without a fight! For this adventure, we have Stephen Glicker, John Staats, Jason McDonald, Chris Beemer, Bob Markee, Rob Trimarco and Jason Keeley. But this being Starfinder Society, we will have different players for adventures in the future. The Roll For Combat Starfinder Society continues their adventure through Starfinder Society Roleplaying Guild Scenario #1-10: The Half-Alive Streets. In part 3 of the adventure, our heroes arrive on a strange scene and somehow manage to make it worse. Much worse. The Roll For Combat Starfinder Society continues their adventure through Starfinder Society Roleplaying Guild Scenario #1-10: The Half-Alive Streets. In part 2 of the adventure, the gang follows up with their lead… and ends up relying on dumb luck to save them all from certain death! We also provide details on how you can perhaps join us on a future show as a Starfinder Society player!